The rugged terrain of Otago may be ‘Lord of the Rings’ beautiful, but can turn from t-shirt sun to ice cold snow in minutes. Long time supporter of the Otago Search and Rescue Organisation (SAR), Lodge St. Patrick now have a trophy named after them. A new initiative by SAR has seen a three-tiered tracking competition come into being with ‘Advanced’, ‘Intermediate’ and ‘Novice’ divisions. 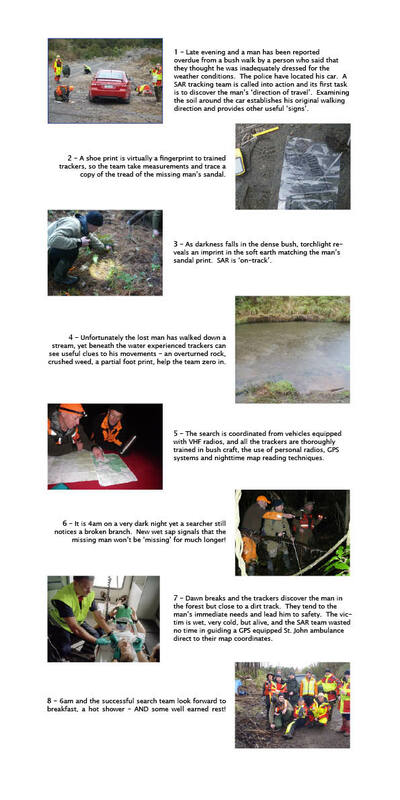 The 3-day competition is open to all-comers, to anyone who is (or wishes to learn to become) a tracker in Wilderness/Bush, Avalance and/or Disaster conditions. All three catagories are covered in this man-against-the-elements challenge (and learning) scenario. So popular is the Otago-based event that team enquiries have come from as far afield as the UK and USA. Operations Manager and competition organiser Paul Kelly said, “There has long been a need in world-wide Search and Rescue for an international event like this. A truly challenging competition that will direct the individual’s (and team’s) focus on the ‘core skills’ of search and rescue in hostile environments, and to avoid becoming a victim themselves! If it was not practice and training for so seriousus an issue, tracking would almost be an “IronMan” sport in itself. Well rehearsed, finely honed coordination between trackers, search vehicles, helicopters, and the hospital is sometimes the difference between life or death. The various levels will challenge the teams to display their prowess for finding an ‘injured person’ at night, working with tracker dogs, and communications and co-operation skills while working with other SAR members and helicopters. The trophy for the ‘Advanced’ category will be called the ‘Ross Gordon Cup’, so named for Ross Gordon’s self-sacrificing dedication to promoting the vital need for search and rescue in New Zealand. (For reasons that are obvious to anyone who has visited the country.) The ‘Intermediate’ bush tracker level will be called the ‘Nick Coin Cup’, but all SAR trackers often have to go back-to-basics’ when in the field so, to keep these basic skills sharp, the ‘novice’ challenge has come into being, and Lodge St. Patrick is happy to support this division and very pleased that Otago SAR has called its’ novices award, ‘The Lodge St. Patrick Novice Tracker’s Trophy’. It all sounds very exciting and we will follow developments with interest.